1. a) Design a four-bar crank rocker quick return mechanism to give a time ratio of 1.25 with rocker swing angle as 75° clockwise. Assume the output link (rocker) length as 50 mm and in the left extreme position it is vertical. b) Sketch a four-bar crank rocker mechanism in (1) Maximum transmission angle position and (2) toggle position where mechanical advantage is infinity. 2. With the help of a neat sketch explain the working of Whitworth quick return mechanism. 3. With the help of a neat sketch explain the working of Single slider and double slider crank chain mechanism. 4. With the help of a neat sketch explain the working of Oldham’s coupling. 6. In a four link mechanism, the dimensions of the links are AB=200 mm, BC=400mm, CD=450 mm and AD=600mm. At the instant when DAB=90°, the link AB has angular velocity of 36 rad/s in the clockwise direction. Determine (i) The velocity of point C, (ii) The velocity of point E on the link BC When BE =200 mm (iii) the angular velocities of links BC and CD, iv) acceleration of link of link BC. 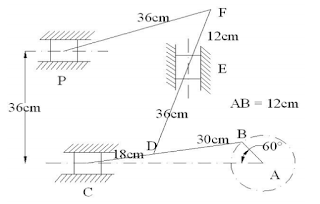 centre position, determine : a) Velocity of piston b) Angular velocity of connecting rod. C) Velocity of point E on the connecting rod 1.5m from the gudgeon pin. D) velocity of rubbing at the pins of the crank shaft, crank and crank cross head when the diameters of their pins are 50mm and 60mm and 30mm respectively. 9. A four-bar mechanism has the following link length in mm. Input, A0A = 25, AB = 70, output B0B = 45 and frame A0B0 = 60. Coupler point A is above and B is below the horizontal frame link A0B0, respectively. When the input link is in an angular position of 1050 counter clockwise from the frame link, draw the four bar mehcnism and locate all the instantaneous centres. If the input link rotates with a constant angular velocity of 2.5 rad/sec clockwise, determine the linear velocity of B of the output link and the angular velocity of the output link. 10. In a steam engine mechanism shown in figure a) the crank AB rotates at 200 rpm. The dimensions of various links are AB = 12cm, BC = 48cm, CD = 18cm and DE =36cm, EF = 12 cm and FP = 36cm. Find the velocities of C,D,E,F and P.
follower is offset by 20 mm from the axis of the cam shaft. mm and the roller is 20 mm in diameter. Find the cam proportions and plot displacement, velocity and acceleration for one full cycle. revolution. The valve remain closed during the rest of the revolution. The diameter of the roller is 20mm and the minimum radius of the cam is 25mm. The axis of the valve rod passes through the axis of the cam shaft. If the cam shaft rotates at uniform speed of 100 rpm; find the maximum velocity and acceleration of the valve during raising and lowering. Also draw the profile of the cam. 17. 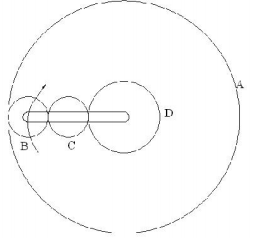 In an epicyclic gear train the internal wheels A and B and compound wheels C and D rotate independently about axis O. The wheels E and F rotate on pins fixed to the arm G. E gears with A and C . Wheel F gear with B and D. All the wheels have the same module and the number of teeth are: TC =28 TD=26; TE = TF=18. (1) Sketch the arrangement, (2) Find the number of teeth on A and B, (3) If the arm G makes 100 rpm clockwise and A is fixed, find the speed of B , and (4) If the arm G makes 100 rpm clockwise and wheel A makes 10 rpm counter clockwise; Find the speed of wheel B. 18. In a reverted epicyclic train, the arm F carries two wheels A and D and a compound wheel B-C. Wheel A meshes with wheel B and Wheel D meshes with wheel C. Ther number of teeth on wheel A, D and C are 80, 48, and 72. Find the speed and direction of wheel D , when wheel A is fixed and arm F makes 200 rpm clockwise. 19. The sun planet gear of an epicyclic gear train, the annular D has 100 internal teeth, the sun gear A has 50 external teeth and planet gear B has 25 external teeth. The gear B meshes with gear D and gear A. The gear B is carried on arm E, which rotates about the centre of annular gear D. If the gear D is fixed and arm rotates at 20 rpm, then find the speeds of gear A and B.
number of teeth on C and speed and sense of rotation of wheel C.
b) Briefly explain the following : 1) Slip of the belt 2) Creep of the belt. 24. A single plate clutch is required to transmit 8 KW at 1000 rpm. The axis pressure is limited to 70 KN/m^2. The mean radius of the plate is 4.5 times the radial width of the friction surface. If both the sides of the plate are effective and the coefficient of friction is 0.25. find a) the inner and the outer radius of the plate and the mean radius, b) the width of the friction lining. friction is 0.05, estimate i) power absorbed in overcoming friction when the shaft runs at 105 rpm and carries a load of 150KN and ii) number of collars required.